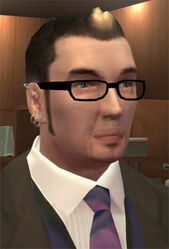 Although Marcus appears in Grand Theft Auto IV, he is not named until Ballad of Gay Tony. He works at the clothing store Perseus. His dialog and voice acting imply that he is meant to be read as homosexual (video available here). There are also pedestrians in the game who look like Marcus and are voiced by the same actor, but who wear different clothes. This entry was posted in 2000s, Gay, Gay (implicit), Queer Men on September 12, 2015 by Adrienne Shaw.